Did you know experts estimate that only about 30% of people actually use their garages to store vehicles? If you guessed that the reason is "too much stuff," you win the prize. 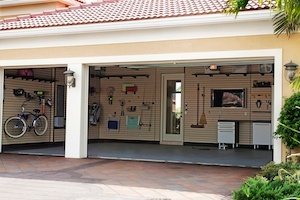 The garages at our Springs luxury apartment homes can serve a wide variety of purposes. Whether you use it as a workroom, exercise space or just to hold your car, here are some of our favorite organizing and storage tips. Efficient organization always begins with careful planning. Measure the dimensions of the garage and your car so you know exactly how much space you have to work with. In a garage, just as in an apartment, the best way to go is up. The higher storage goes, the less valuable floor space it takes up. Plastic bins with labels are popular storage containers, but in most cases they end up in a pile. Who wants to unstack and stack them whenever you need to find something? Simple plywood towers let you slide the bins in and out without disturbing the others. Balls, skates and other sports equipment always present a storage problem. A tiered cabinet with slanted shelves keeps everything in place but allows easy in-and-out access. It's also great for organizing toys. Don't stop at the walls. Garage ceilings provide useful storage space as well. Easy-to-install hooks come in a variety of shapes to hold bikes and other awkwardly-sized items, and they're coated in vinyl to prevent scratches. Be sure to follow weight guidelines from the manufacturer. Pegboard is an incredibly versatile storage solution for tools, crafting supplies and just about anything else you can think of. It comes in different materials and can be cut to fit any space. Since pegboard is flat, there are no sides or doors to restrict the size of items it holds. Corners often go to waste. Ready-made or DIY corner shelves are a nice way to take advantage of those neglected areas. Over-the-door shoe organizers are great for holding smaller items such as spray paint cans and duct tape. Attach magnetic strips to the wall and use them to hold metal tools or old soup or coffee cans. Don't throw away those baby food, salsa and mayonnaise jars! They're the perfect size to hold screws, nails, glass beads and other tiny, easily scattered items. No matter how tightly you close them up, seasonal clothing items are bound to pick up dust and fumes. Pet food and bird seed are likely to attract insects and other pests. Cardboard boxes are vulnerable to dampness and temperature fluctuations. Photographs, letters and other items of sentimental value should be safely stored inside your apartment. When you're planning your amazingly creative ideas for your garage, please ask a member of our Springs on-site management team, they will be happy to advise you on what's acceptable in your community.